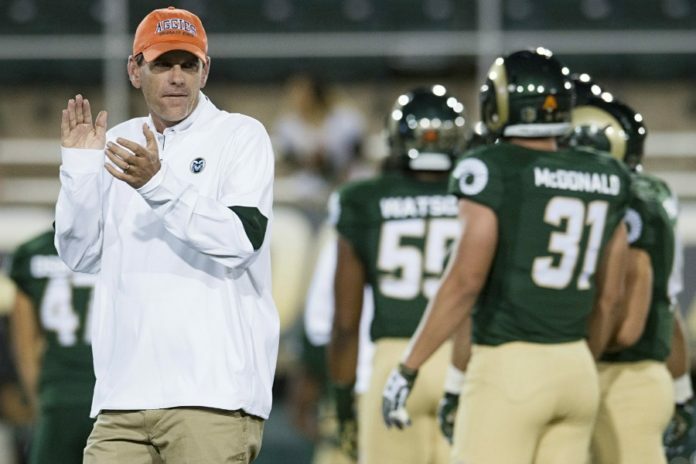 Colorado State head coach Mike Bobo announced Tuesday that Dave Johnson has been hired to coordinate the Rams’ running game and coach the offensive line. Johnson, a veteran of 34 seasons coaching in college football, joins the Rams from Ohio where he coached the offensive line and served as run-game coordinator for a Bobcats team that ranked 16th in FBS in rushing (244.5 yards per game) and set school records for scoring (39.1) and yards-per-carry (5.7). In his career Johnson has coached in 17 bowl games, won nine DI conference championship titles (Big East, SEC, MAC) and mentored 12 NFL players, five All-Americans and 32 all-conference selections. Johnson spent the past four seasons as Ohio’s offensive line coach, and before the 2017 season added co-offensive coordinator duties to direct the run game. The Bobcats finished 9-4 with a bowl victory in 2017, and in addition to school records for scoring and rushing average, rushed for a school-record 44 touchdowns, ranked ninth in FBS in scoring, and ranked 12th in red-zone offense (91.9%) and 16th in sacks allowed (1.23). Johnson and Bobo coached together at Georgia from 2001-07, when Bobo was quarterbacks coach and Johnson was tight ends coach. Prior to his four years at Ohio, Johnson was run-game coordinator and offensive line coach at UMass for one season (2013). He served as tight ends coach at Cincinnati from 2011-12 and offensive line coach at West Virginia from 2008-10, following his eight-year stint as Georgia’s tight ends coach (2001-07). With Bobo and Johnson on the offensive staff the Bulldogs won 72 games and claimed three SEC East Division Championships, two SEC Championships, five bowl wins and five Top-10 national finishes. Four of his Georgia tight ends—Randy McMichael, Ben Watson, Martez Milner and Leonard Pope—went on to careers in the NFL, as did his Cincinnati tight end Travis Kelce, drafted in the third round by the Kansas City Chiefs. A graduate of West Virginia and four-year letterwinner at center for the Mountaineers, Johnson began his coaching career as a graduate assistant at his alma mater from 1984-85. He then coached offensive line and tight ends, and directed strength and conditioning, at Shippensburg in 1986 before a nine-year stint in the same capacities at Indiana (Pa.) University (1987-1996) and a four-year stint at tight ends coach at Marshall (1997-2000). Johnson started at center for the Mountaineers on their 1981 Peach Bowl and 1982 Gator Bowl teams. He earned his bachelor’s degree from WVU in 1985 and his master’s degree in 1986. Dave and his wife Lynn have four children, Andrew, Lauren, Zachary and Mark.